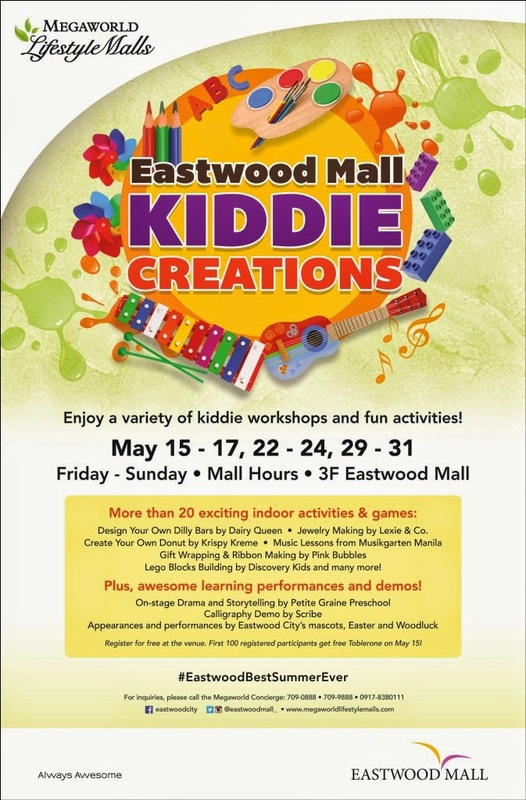 Kids and the kids at heart are in for some special treats from Eastwood Mall at Kiddie Creations, where more than 20 fun workshops and indoor activities await every Friday to Sunday this May. Every Friday to Sunday, the 3rd floor of Eastwood Mall will be transformed into a wonderland of kid activities. Kids with the sweet tooth will definitely have fun designing their own Dairy Queen Dilly Bars and creating their own Krispy Kreme doughnuts. Storytelling sessions with the kids that will surely delight them. Boys will get to play Sands of Time and their favorite Marvel characters over at CMY Toys and Collectibles, while the girls will surely enjoy jewelry making with Lexie & Co., and gift wrapping & ribbon making with Pink Bubbles. Aspiring young musicians will get to play their favorite musical instruments and can get free lessons from Musikgarten Manila. Those who would want to test their memory will absolutely like Surfer Girl’s Memory Game. Kids can also play and build lego blocks of every shape and size with Discovery Kids. Kids can with a green thumb can also combine their love of plants and art through Bannister Academy’s activities like Sponge Painting, Embossed Leaves Coloring, Monggo Seed Art. Aside from these interactive workshops, all participants will also witness awesome learning performances and demos. Petite Graine Preschool will be staging a mini-drama and storytelling for the kids. Meanwhile, Scribe Writing Essentials will host a calligraphy demo for kids and adults alike. Plus, Eastwood City’s very own mascots, Easter and Woodluck, will make an appearance and perform a very special number for all participants! 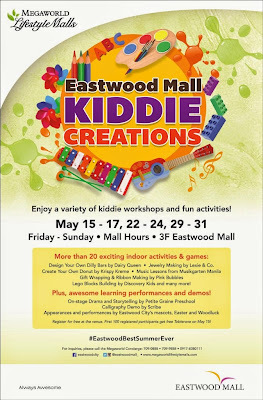 All these and more will happen at Kiddie Creations at Eastwood Mall on May 15 to 17, May 22 to 24, and May 29 to 30, from 11am to 11pm. Event is open to all kids age 3 to 12 years old. Interested parents and guardians can register their kids for free at the 3rd level of Eastwood Mall during event days. For more information on Kiddie Creations, guests can call the Megaworld Lifestyle Malls Concierge at 709-0888, 709-9888 or 09178380111 or visit www.megaworldlifestylemalls.com. Oh, I'm so sorry dear. I feel bad for you and your son. I didn't know there will be fees because I had just posted their press release. I'll try to get to them and tell them your sentiments. Again, my apologies.